The first piece of code acquired by the Smithsonian's Cooper-Hewitt National Design Museum -- "Planetary", written in C++. Cooper-Hewitt has just acquired its first piece of code. Although the collection has objects that are the end result of algorithmic processes, notably Patrick Jouin's 3D printed chair, Solid C2, this is the first time that code, itself, has been collected. Almost all contemporary design practice involves digital processes -- from the ubiquitous Adobe design software to CAD packages used by product designers and architects, to the simple day-to-day office management and accounting software -- it would be difficult to find a designer who lives entirely 'off the grid.’ Despite this, design museums have been slow to start to add software to their permanent collections. Some of this reticence to collect digital objects stems from deep uncertainties as to how to preserve and present such objects to future visitors and future scholars. But for Cooper-Hewitt these uncertainties have been a strong driver to experiment. So, here we have Planetary. Planetary is an iPad application written in C++ using the Cinder framework. 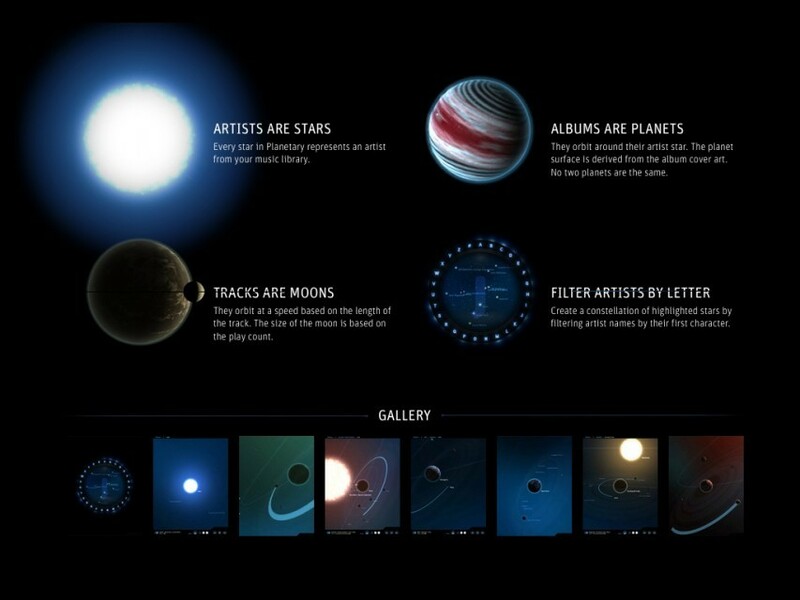 Planetary offers an alternative music player application for the iPad that visualizes your music collection as a series of celestial bodies. Songs are moons, albums are planets, artists are suns—and the orbits of each are determined by the length of albums and tracks. Their brightness represents their frequency of playback.